EYHOV Double is two-sided workstation with acommon Accessory Rail through the middle. Suited for creative collaborative teamwork and space optimization, it can be expanded in linear runs and configured with returns and privacy panels. EYHOV Single workstations with Accessory Rail. 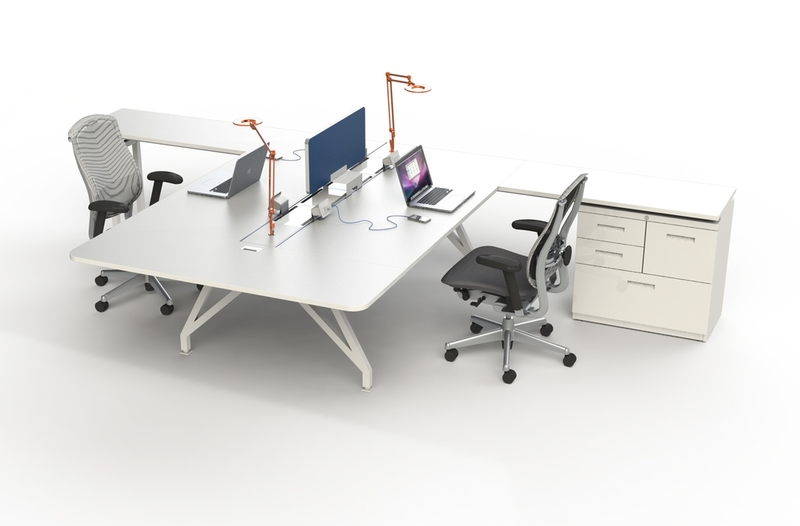 Ideal as a stand alone desk, or for perimeter desking setups where it is configured in multiple linear runs. Connect to angles to create L or U shaped team spaces. EYHOV Single Workstations by Scale 1:1 inc. 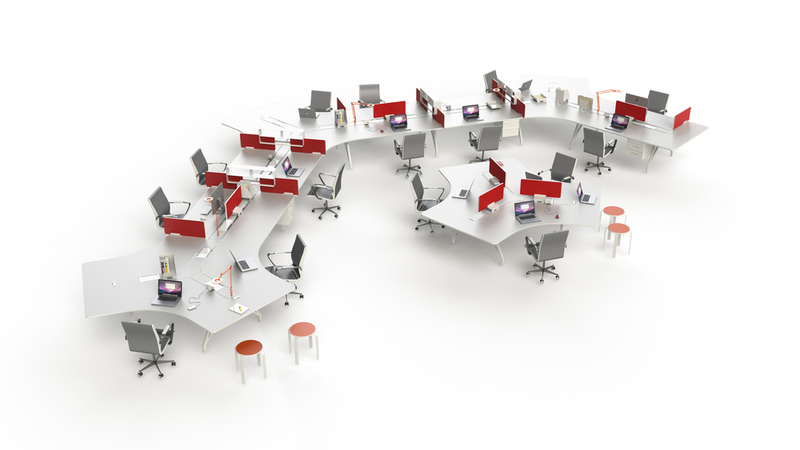 Brilliant and stimulating, the Hub 120 is a collaboration work-pod that can be expanded into dynamic configurations. 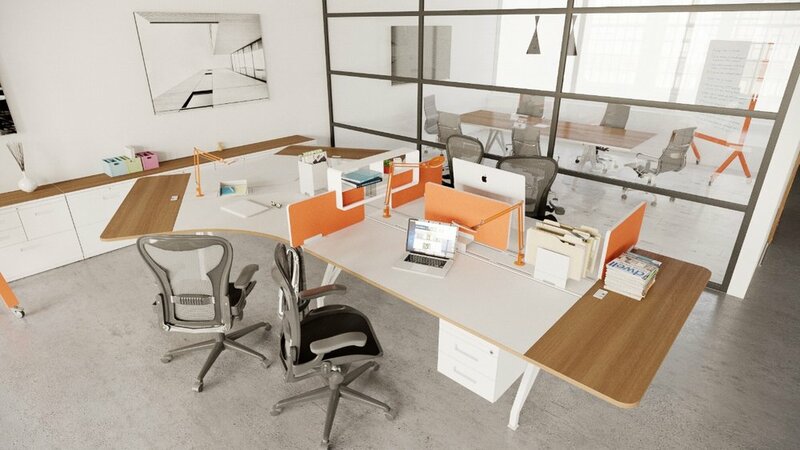 EYHOV office workstation collaborative desks system. The flexible and expandable EYHOV Desk System allows you to build and reconfigure your office space to meet the needs of your growing and changing business environment. You can create anything from a functional home office to an entire office. Or build-as-you-go with each component fitting seamlessly with the next, allowing for endless ideas and flexibility. EYHOV Desk System is made up of two basic building blocks: EYHOV Single and EYHOV Double. By joining these with a few other elements and accessories, you can create an endless range of workstation solutions to meet the needs of any environment. EYHOV Single is a one-sided workstation with the Accessory Rail running along one side. It features a full 72" x 27" standard size desktop. 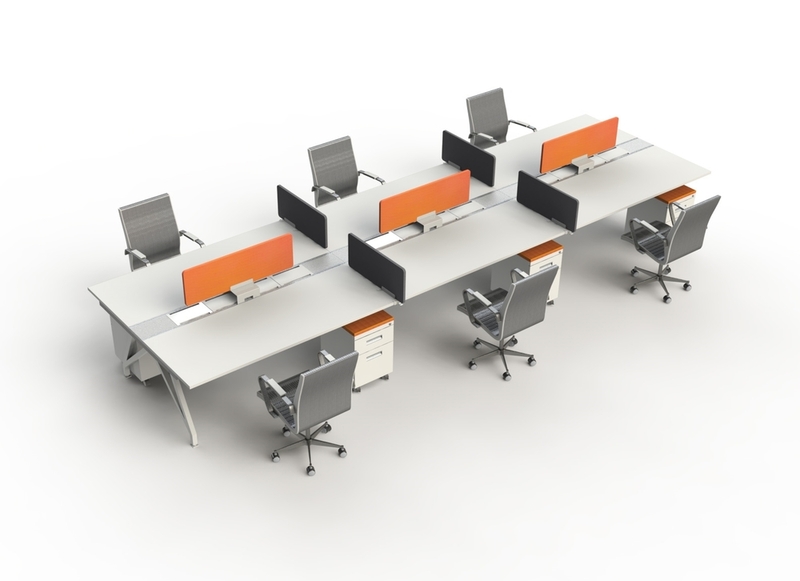 Ideal as a stand alone desk, or for perimeter desking setups where it is configured in multiple linear runs. Connect to angles to create L or U shaped team spaces. EYHOV Double is two-sided collaborative desk workstation with a common Accessory Rail through the middle. It features two 72" x 28" desktops. EYHOV Hub 120 was designed to integrate effortlessly, easily adapt to changes, and extend planning possibilities for a uniquely functional workspace. At Scale 1:1 we aim to inspire creativity through ergonomic design and playful functionality. 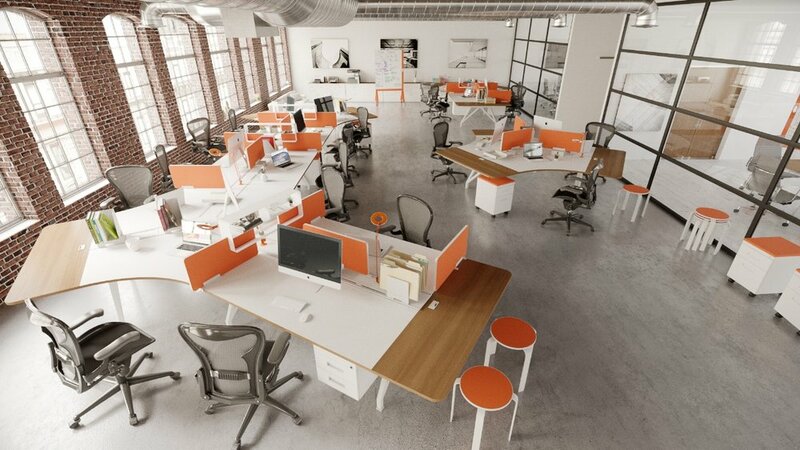 EYHOV workstations stimulate the flow of ideas in an open yet personalized work environment. Desk solutions include open collaborative team workstations, private office desks, shelving storage units, room dividers, and more. EYHOV Desk System can grow as you grow. Every component can be fitted and re-fitted to form new configurations and arrangements that adapt to your needs. Components are made to allow for easy re-configuration without special tools. Break-down and rebuild an entire office quickly and easily. EYHOV accessories add endless utility and customization to expand and configure the EYHOV Desk System to match your needs. Power and Data: Mounted desktop power units for quick, arm's length plug-and-play charging without crawling under the desk. Four circuit power system powers up to 10 workstations per daisy-chain. Accessory Rail: The unique Accessory Rail built into EYHOV Desk System makes it easy to add features such as LED task lighting from Pablo designs, letter and file boxes, privacy panels, integrated power, and discreet cable access panels. Privacy Screens: Colorful privacy panels and side partitions define the workspace and block sight-lines. Perfect for collaborative environments, EYHOV screens are easily removable effectively creating collaborative space between desks. Features include four color options, built-in bag hook, and drop-on shelving modules. Storage: Add functionality to the workspace with lockable personal storage drawers mounted under the desk, or shelving modules that drop onto side partitions - perfect for keeping reference materials nearby. The welded steel frame components feature precision fit and can be easily assembled and disassembled for reconfiguration or relocation. No special tools required. Steel frame powder coated in a high durability white finish. Integrated height levelers. Sliding Partitions with Whiteboard Writable Surfaces. Built to last a lifetime. Powder Coated Steel Frame and Legs. EYHOV hard-wearing laminated table tops resist staining and scuffing for years of low-maintenance service. Tops are made from 1" melamine and feature a durable 2mm edge banding. In white, white gloss, maple, Brasil Wood, and Sandcastle finish. Custom surfaces available on request. Privacy screens and task lamps can be ordered in a range of vibrant colors that bring a spark of life to any environment. Standard colors include: Tangerine, Arctic Blue, Scale Green, and Red. 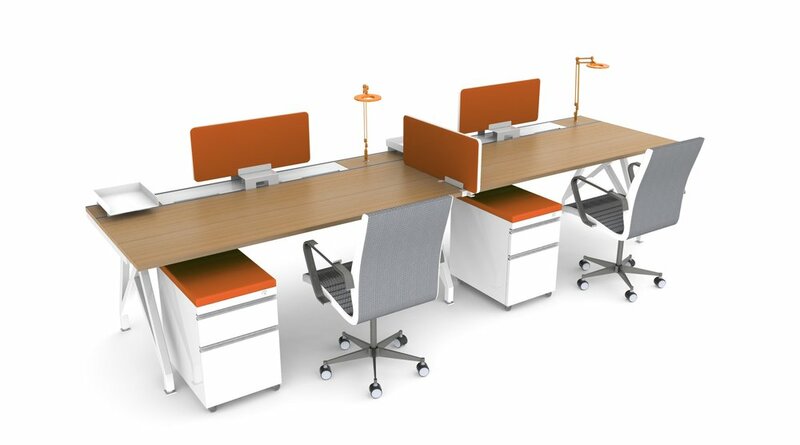 EYHOV Desk System was created by David Winston to solve the timeless challenge of delivering a high quality, ergonomic, modular, and scalable workstation solution. The elegant simplicity, and innovative construction of EYHOV are hallmarks of David's design sensibility. Easy to setup, with features that make busy, shared office spaces more productive. 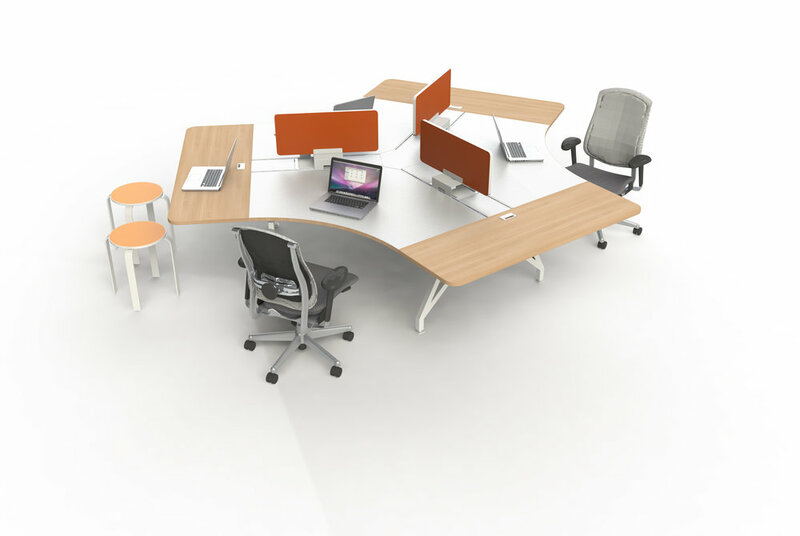 With EYHOV Desk System your team will find inspiration and collaboration. EYHOV is ideal for design studios, architecture firms, or other creative fields. And when the team grows, you can quickly expand by adding more EYHOV Desk System components. 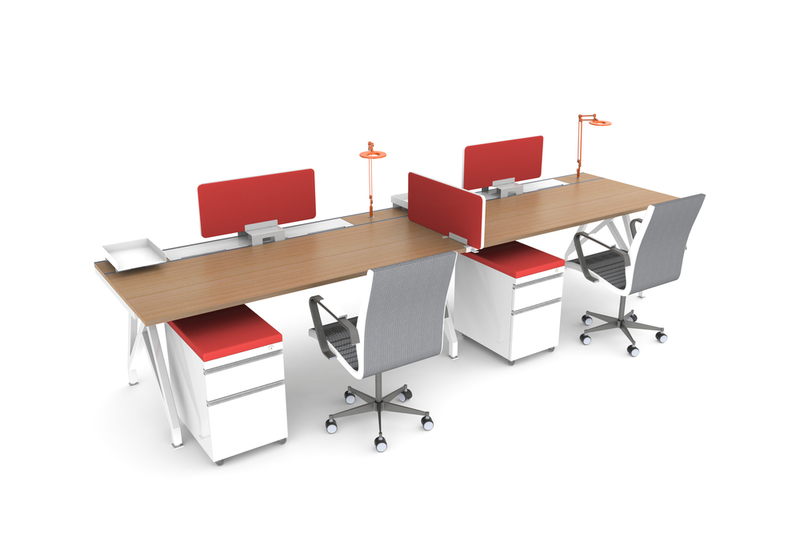 EYHOV is a high quality, ergonomic, modular, and scalable workstation solution. It offers excellent value for large-scale deployments. Hard-wearing surfaces provide years of service, and easy re-configuration saves time and money. 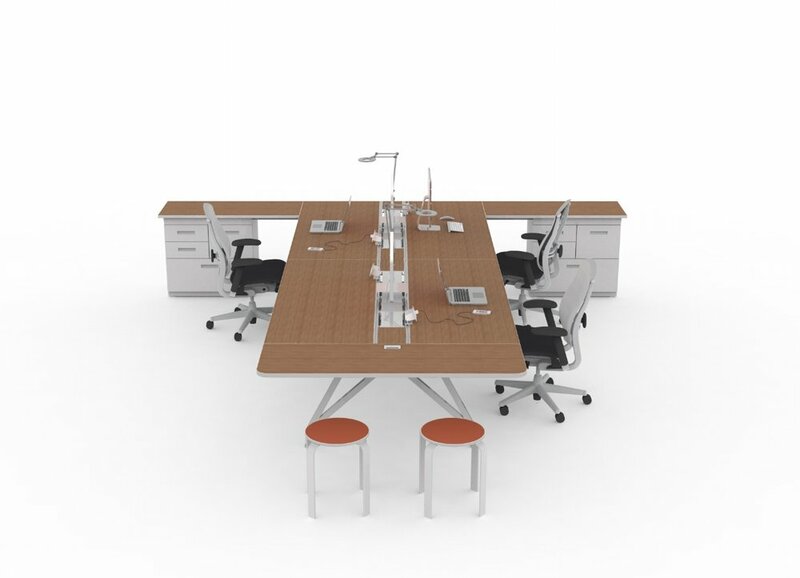 EYHOV Desk System suits corporations of all sizes.